Hi-de-ho there people! Just thought you might want to see a beautiful layout I created using two gorgeous DCWV stacks! Both of these stacks are just FULL of metallic foil accents. I can't help but just flip through them and drool at all that glitz and shine! I decided that I needed an to make an extra special layout using these stacks, that featured an extra special lady I know, my niece, Devon. I was inspired by the lace on her dress to choose some of the lace prints in the Midnight Berry stack. The background of the photo didn't really match, so I did some ethereal photoshopping and made the background black and white and gave her silhouette a little glow. I used several Spellbinders flower dies, vine dies, and leaf dies to make the flower cluster at the bottom. 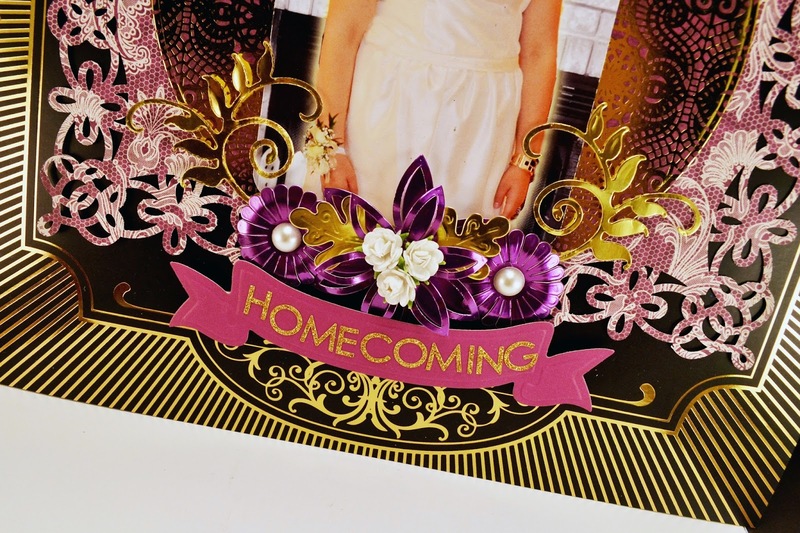 These papers cut beautifully, even on the intricate dies - they are very sturdy specialty cardstock. The banner is also a spellbinders die and I spelled out the title using my FAVORITE letters - small glitter letters from Sticko. Have you ever created a layout using so many patterns and paper treatments? How did it go? I think this one came out awesome because I stuck to a very focused color pallet.